COLORADO SPRINGS, Colorado (VN) — In the end, it really didn’t matter if he’d won or lost. Jens Voigt, the 42-year-old German whose career has spanned two decades, was off the front, alone, battling against the wind, the peloton, and his own inner demons, one last time. In his final race, in what has been a season-long farewell tour, the fan favorite from Trek Factory Racing was doing what he’s done best since the Clinton administration — suffering, tempting fate, attempting to defy the odds. After making it into the day’s 12-rider breakaway, Voigt attacked with 40km remaining on stage 4 of the USA Pro Challenge in Colorado Springs Thursday, on the third of four 25km circuits that included a steep climb leading into the red-rock wonderland of the Garden of the Gods, followed by as a short kicker 2km from the finish line. Voigt’s advantage was never more than 90 seconds over his former breakaway companions, but topped out at a good three minutes back to the main peloton, which consisted of an odd mix of motivated sprint teams and GC contenders. 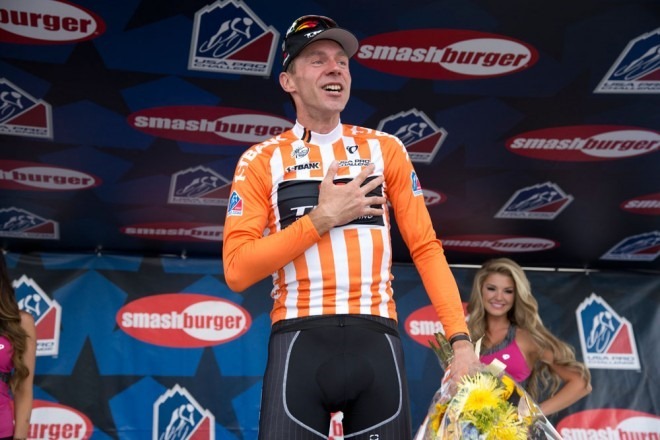 Teams that missed the move, such as Optum-Kelly Benefit Strategies and Garmin-Sharp, chased early, while teams with top sprinters, such as SmartStop, Hincapie Sportswear, and Cannondale, drove the effort late, despite the efforts of Voigt’s Trek teammates to slow the chase at the front. On a day that wasn’t expected to impact the general classification, there was little question as to what the thousands of fans along the course hoped to see. Signs proclaiming Voigt’s catchphrase, “Shut Up Legs!” were abundant. T-shirts reading “Jens! Jens! Jens!” lined the finishing straight. Voigt had won a race at least once in every one of his 16 years as a pro, and had been winless, up to this point, in 2014. Twitter was ablaze with support for the old man who could, the hard-working father of six; there was a nearly universal desire to see the cagey, charismatic Voigt go out on top. Within the final 10 kilometers, it was anyone’s guess as to whether the veteran breakaway specialist would hold off the hard-charging pack. The gap had fallen to one minute, and it was coming down quickly. With 5km to go, the gap was 35 seconds. With 2km to go, and one short, steep climb remaining, the gap was under 20 seconds. Would he hold it, and win one last time? Or would he be absorbed by an unsentimental peloton? And in the end, did it matter? In the end, Voigt was caught inside the final kilometer, steamrolled by hungry, younger bike racers looking to create their own legacies. Cannondale’s Elia Viviani won the stage ahead of Martin Kohler (BMC Racing). Voigt finished 67th, 52 seconds down, completely spent. Yet during the podium celebration, where Voigt was awarded as the stage’s most aggressive rider, the cheers were, by far, the loudest of the day. With a hard mountain stage looming on Friday (Voigt said he’d likely hide in the peloton and recover), an uphill time trial on Saturday, and a likely field sprint on Sunday, Voigt had taken his final opportunity, and he’d given his all. And in that sense, he’d gone out on top. After the stage, VeloNews asked Voigt if — even though he hadn’t taken the stage win — he had been able to soak up the experience of one final, odds-defying breakaway, and if that wasn’t a victory in itself. Voigt’s response was, like the man himself — energetic, entertaining, and filled with emotion. “Despite the fact that I was hurting, yes, I was also soaking it up,” he said. “I saw all the signs on the roads — ‘Shut up legs,’ and ‘Farewell, Jens.’ I could hear the people on the road, the fans. And it felt like it was my home crowd. I wanted it like that, one more time in the last week of my career. I felt obliged to show it one more time, to try to win in the fashion they would expect. ‘Maybe, in a bizarre way, it was fitting it ended like this,” he continued. “This is the story of my life — from 20, 30, even 40 breakaways, maybe one works. This was the typical breakaway, you give it all, and you get caught. It was a perfect example of my career — you put it all on the line, you’re taking risks in looking stupid.